Moonlight washed over the canvas village. 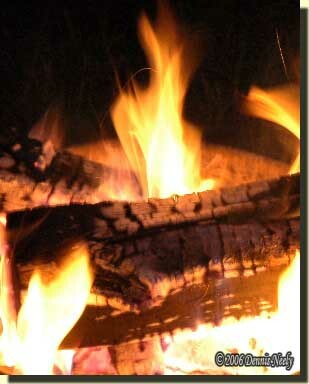 Stars twinkled in the ethereal darkness; fires flickered down in the valley. Candle lanterns glowed in the evening’s pleasant coolness, and once in a while a candle’s light moved from camp to camp. A banjo twanged to the south, and a mountain dulcimer droned to the east. Uphill a ways, a reveler’s distinctive laugh brought an involuntary chuckle. A ram’s horn blared twice, somewhere over by Laughery Creek in what’s called “the six acres,” a limited hook-up camping facility on the home grounds of the National Muzzle Loading Rifle Association, in Friendship, Indiana. Our conversation paused as we both waited for the inevitable response, which took much longer than normal. Now there is a mythical, almost magical, air that engulfs one’s inner-self at Friendship, if you let it. The experience is hard to describe—“you have to be there,” as the saying goes. Like an invisible mist, this mystical aura comes and goes—on the shooting range, while swabbing out fouling or in the wee hours of the night. It possesses a will of its own, seated deep in an unmistakable kinship with the souls of yesteryear and the old shooting irons of long ago. On that September evening, the ram’s horn exchange ushered in a quiet peace. Tami and I talked of the prospects for the fall hunts, the course of our living history adventures and my new persona: an individual captured in his youth and adopted by the Ojibwa or Potawatomi who eventually returned to white society in the lower Great Lakes, but could not find it within himself to give up the hunting ways of his Native American family. For some folks, Labor Day marks the end of summer, but for me, the Fall National Championship Shoot at Friendship is the benchmark. The week-long shoot falls at the beginning of small game season here in Michigan. Although I didn’t shoot this year, most years the stiff competition and wide variety of events serves as a tune-up for hunting. Indeed, inhaling the glorious stench of spent black powder should awaken any woodsman’s sense of wilderness wanderlust. At that point in the evening, our discussion centered on a new trade shirt. Mid-summer I purchased a fine piece of linen to make a ruffled shirt, but the time needed to hand-sew the garment just never materialized. Faced with the immediacy of a fall turkey hunt, an impending outdoor show and the availability of ready-made shirts at Friendship, Tami tried to convince me to part with a few hard-earned dollars. She was right, and I agreed. Any given persona is rarely based on one individual’s life, and my answer to “What does the documentation say?” reflected the need for a broader sampling of primary references. This persona is inspired by John Tanner, one of my favorite hunter heroes, but Tanner says little about his shirts, other than “I had bought a shirt…” (Tanner, 193). And of course, Tami jumped on that statement. The “documenting” of any item incorporated in one’s persona should include a reasonable mix of the written word, existing museum artifacts and paintings, illustrations or drawings from the period. Sometimes this mix of primary sources is not possible, but that is still the goal. I know of two ruffled shirts attributed to the Great Lakes region. One belonged to Sir John Caldwell, an British officer in the King’s Eighth Regiment of Foot who served at Fort Detroit about 1780 (Brasser, 2), and the other, on display at the National Museum of the American Indian in New York, is attributed to Major Andrew Foster, another British officer who acquired the shirt between 1790 and 1795 in the region between Fort Michilimackinac and Fort Miami. Countless images of ruffled shirts exist to aid in selecting an appropriate representation. Although his paintings and sketches date from the late 1830s, I have found the work of George Winter to be a helpful guide in my journey of discovery (Cooke & Ramadhyani), especially as it relates to the Potawatomi people who lived in the area about the headwaters of the River Raisin and the North-Forty. The next morning found me searching the racks of several different merchants who set up shop at Friendship. 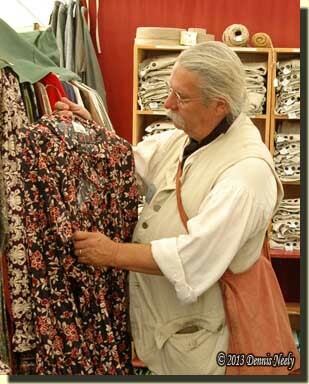 I found a floral-print ruffled shirt amongst the offerings at Michael Pullins’ Ohio Valley Peddler. The cotton fabric’s pattern approximated designs I remembered from Textiles in America: 1650-1870. The shirt’s length measured 40 inches, a tad longer than the Caldwell or Foster shirts, which measure a little over 36 inches. A friend who has seen the Caldwell shirt noted that the hem appeared to be torn, thus shortening the shirt—a possible choice for this garment. The sleeves are a bit long for my arms. 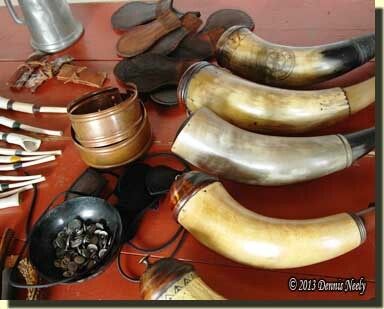 Around the corner and down the stone path from the Ohio Valley Peddler I remembered seeing a pair of copper arm bands at the horner’s shop, sitting on the back table, overshadowed by several fine powder horns and assorted trade goods. Arm bands were a common trade item and often included as personal adornment by both the Ojibwa and Potawatomi. Tanner doesn’t mention arm bands specifically, but on a number of occasions he references silver ornaments, including “…I stripped off all my silver ornaments and hung them up in the lodge…” (Tanner, 67). Maybe? The resident horner asked a fair price for the copper arm bands, and once in place, they should solve the shirt’s long-sleeve issue. Native Peoples from Michigan’s Upper Peninsula mined and traded copper. Until I can afford silver ornamentation, I need to do further research on the copper arm bands. Right now I am in the infant stages of developing the returned-captive persona. The ruffled shirt, the arm bands and the other material goods I am assembling represent my best understanding of what constitutes a truthful interpretation of my persona’s life circumstance. In a month or a year or even several years down the path, the folly of this attempt may bring a smile to my face or even a hearty belly laugh. But the point I wish to emphasize is that I am not waiting to enjoy my new alter ego’s life experience. I am not hesitating because I lack exact, unequivocal, irrefutable evidence for every aspect of my kit. I am moving forward, and doing so with the full intent of pursuing wild game as a native captive who returned to white society, but can’t give up the Ojibwa or Potawatomi ways. And besides, when I release the death bees, the wild turkey, the fox squirrel and the cottontail rabbit give little mind to the historical significance of a native captive’s attire. 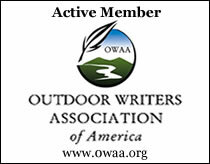 This entry was posted in Clothing & Accoutrements, Persona and tagged Dennis Neely, historical trekking, North West trade gun, Northwest trade gun, trade gun, traditional black powder, traditional black powder hunting, traditional blackpowder, traditional blackpowder hunting. Bookmark the permalink.